I made my first carrot cake in 1991. I was a poor college student, bored on a Sunday afternoon and craving a treat. I flipped through my lone cookbook and found a recipe that could be made entirely of things I already had on hand. It would also help me use up a large bag of carrots, which had been languishing in the refrigerator. Mixing the cake proved to be easier than I had thought it would be, and when it came out of the oven, I was pleased with how it looked and even more impressed with the heavenly scent filling my tiny apartment. I didn’t have cream cheese in the house and didn’t want to trek to the store, so I whipped up a simple buttercream frosting and slathered it on the cake. What happened next shocked and amazed me. One of my roommates mentioned to a neighbor that we had cake and pretty soon, the apartment was filled with guests eager to try a slice. These guests were overwhelmingly of the male persuasion, and in a flash, the cake was gone and people (boys) were chatting me up and complimenting my dessert-making skills. I decided that Sunday afternoon dessert was now a tradition, based solely on the benefits it provided to my social life. In the weeks that followed, I made piles of chocolate chip cookies, pans of brownies and more seven-layer bars than I care to remember, but the carrot cake stands out in my memory as the food that taught me about the way a tasty treat can bring people together. That desire to bring people together isn’t unique to college students, and while carrot cake is delicious anytime, it’s truly a fitting end for a feast that often features a bunny bearing gifts. Lots of carrot cake recipes include fancy ingredients like pineapple, pecans and even coconut, but I tend to be more of a purist. This recipe has a lot of carrots, and left unfrosted I think it would be a great addition to a breakfast or brunch party. I cut the cake into small squares and my kids eat it for an after-school snack. Of course it also pairs beautifully with any buttercream or cream cheese frosting you might enjoy, but a simple sprinkling of powdered sugar dresses it up nicely and makes for a not-too-sweet treat. Carrot cake is actually less like cake and more like a quick bread or muffin recipe. Because everything goes in the same bowl, it’s pretty forgiving and makes for quick clean-up. If you like a strong carrot flavor and a rustic texture like I do, grate the carrots coarsely. 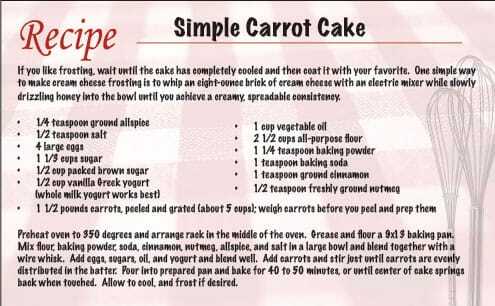 For a more delicate texture in your cake, grate the carrots finely. Because the way you grate the carrots will affect the way they sit in a measuring cup, I suggest you weigh them on a kitchen scale for a more accurate measurement. If you don’t own a kitchen scale, I would strongly suggest you obtain one. They’re inexpensive and infinitely useful, but if you aren’t inclined to purchase one, the rough measurement in cups I’ve provided in the recipe should work pretty well too. Serve this cake frosted or unfrosted, warm out of the oven or after a quick chill in the fridge. Serve it for brunch or after supper. But no matter what you do, be sure to celebrate the coming of spring by sharing it with a friend.